A new Windows 10 build 10074 has leaked online and is now available directly from Microsoft in ESD form or as an ISO file, which you can use to update your existing build. Unlike other builds, which are referred to as "Technical Preview" on the desktop watermark, the leaked unreleased build of the preview OS features a slightly different version, replacing 'Technical Preview' with 'Insider Preview', which makes sense considering the OS is reaching closer to its final release. 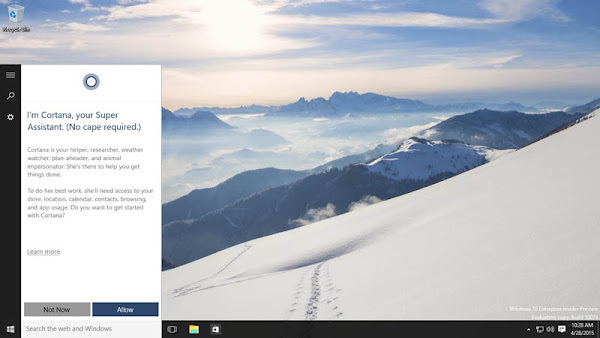 Windows 10 ‘Insider Preview’ Build 10074 includes a number of new features and changes over Windows 10 build 10061, including an improved Cortana UI which now integrates itself into the Start Menu. If you want to try out this latest build, you can download the ESD files directly from Microsoft's Windows Update servers and create an ISO using it, or download the ISO file (x86 or x64) from the mirror links to update your build directly.